Varèse Sarabande Records is excited to announce their newest vinyl release which can be pre-purchased through their website at VareseSarabande.com. The American Film Institute’s list of the greatest films of all-time, (The AFI 100), places Vertigo at #9, and is one of only six entries to note the importance of the film score in the film’s ranking. Along with Hermann’s Psycho, Vertigo is simply one of the greatest pieces of film music ever recorded. Although both of these scores were so highly regarded, neither of them was nominated for an Oscar. The score was composed between January and February of 1958 in London and Vienna after a musicians’ strike prevented the score from being recorded in Los Angeles. Research conducted during the two-year-long film restoration of Vertigo uncovered the original master recordings of the music score at Paramount Pictures. These stereo masters were used on a much-expanded CD of the original soundtrack recording released by Varèse Sarabande in 1996. This vinyl re-issue consists only of the original 1958 soundtrack program. 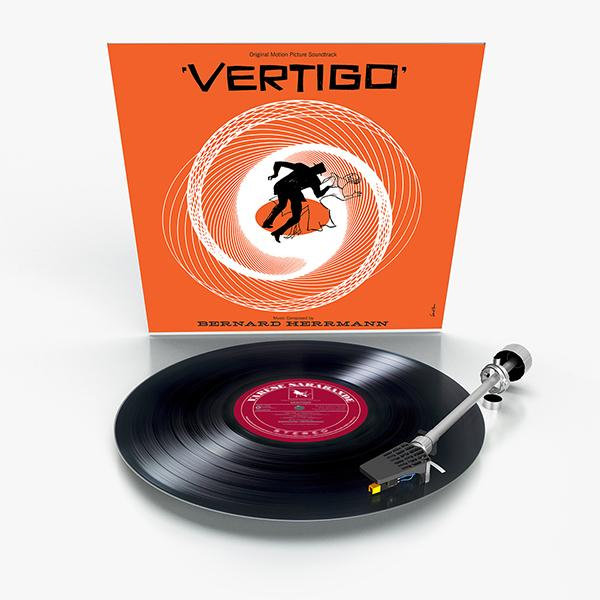 For Vertigo’s 60th anniversary, this LP has been remastered from the analog tapes, pressed at RTI on to 180 gm vinyl, and slipped into a classic tip-on jacket from Stoughton Press. Bernard Herrman was the man behind the low woodwinds that open Citizen Kane (1941), the shrieking violins of Psycho (1960), and the plaintive saxophone of Taxi Driver (1976) and is one of the most original and distinctive composers ever to work in film. Hermann was a prolific film composer, producing some of his most memorable work for Alfred Hitchcock, for whom he wrote nine scores, including Vertigo.